People who enter the United States without inspection (EWI, which stands for Entry Without Inspection; also called undocumented) generally exist in a precarious state while in the country. Without documents that show legal presence, a person generally cannot work except at menial tasks and is not entitled to any federal benefits. However, for some, it is possible to adjust their status while still within the United States - to do so, a person must obtain what is called a provisional unlawful presence waiver. It is still possible to do this nowadays, though the process is not easy. Since entering the U.S. without inspection is a direct violation of the Immigration & Nationality Act (INA), a person who does this is immediately removable from the country if found by Immigration & Customs Enforcement (ICE). This is a simple process, often resulting in expedited removal if someone is found within 100 miles of the U.S. border, which means that they do not even get to see a judge. Even if someone does get to appear before an immigration judge, they will usually simply be informed of the penalties for entering without inspection unless the person can make an asylum claim, citing credible fear of being returned to their home country. The penalties for EWI are quite stiff, though the INA only lists civil penalties and fines. The Illegal Immigrant Reform and Immigrant Responsibility Act (IIRIRA) of 1996 imposes a three-year bar (that is, a period of three years where someone cannot leave and lawfully re-enter the United States) on those who accrue more than 180 days but less than one year of unlawful presence in the country. If someone has more than one year of unlawful presence, they are barred from re-entry for 10 years. Until very recently, someone who had been slapped with a bar would simply have to wait it out, and upon its expiration, they would have to apply for permission to re-enter the country. In 2016, however, U.S. 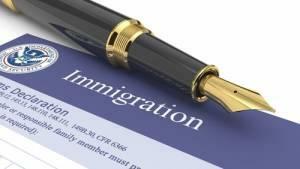 Citizenship & Immigration Services rolled out a process for provisional unlawful presence waivers which allowed certain applicants to apply and adjust status from within the United States. This is an important step forward, as being able to apply for the needed waiver while still in the U.S. means that fewer people will be separated from their loved ones for years while they wait for a reply. Anyone who is “statutorily eligible” for an immigrant visa (meaning immediate relatives of U.S. citizens, family or employment-based applicants who would normally be applying in the standard manner, and anyone who is the recipient of a diversity visa from the lottery) may adjust status within the United States. Anyone else still must leave the country and go through consular processing, meaning having your documents processed at a U.S. embassy or consulate abroad. The standard to receive an unlawful presence waiver is extremely high, regardless of where your request is processed; one must demonstrate “exceptional and extremely unusual hardship” in order to be successful. Entering the U.S. without inspection is never a good idea, but at the same time, it should not be held against you for the rest of your life. If you think you may be a candidate for a provisional unlawful presence waiver, contacting an attorney is a good first step toward making that happen. The dedicated Chicago immigration lawyers at Mevorah Law Offices LLC have years of experience with these cases and are happy to try and help you with yours. Call us today at 630-932-9100 for a free consultation.